Imagine someone promised you a 10% performance increase within just 6 weeks. You’d be skeptical, to say the least. After all, It sounds too good to be true for such a short time frame. Speaking of your velocity at lactate threshold, this is possible. It is one of the best performance predictors for race times of all long distance events. In this article, you’ll learn how to improve it. I won’t go into great scientific detail about the lactate threshold here. 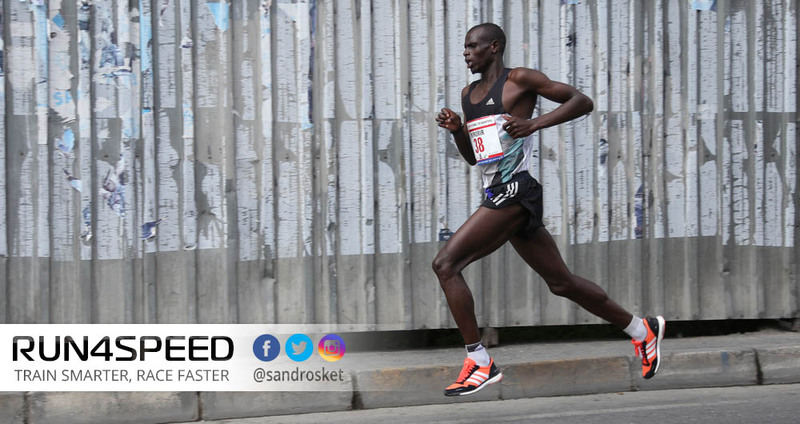 Explained in simple terms, your lactate threshold is the point beyond which lactate (a by-product of your anaerobic energy metabolism) can’t get cleared from your blood as quickly as it is produced. It is associated with the maximum pace you could hold for about 1 hour – roughly 15K race pace for most runners. In 5K and 10K races, you perform above lactate threshold and in half-marathons and marathons you are below it. But race times of all these distances benefit from a lactate threshold upgrade. The reason being, the lactate threshold is expressed as a percentage of your VO2max. In other words, the higher that percentage, the longer you can run near your maximum aerobic capacity. Elite runners have a lactate threshold approaching 90% of VO2max and would be able to complete a half-marathon at that intensity. An absolute beginner, by contrast, typically has a lactate threshold of only 60%, which makes even ‘Easy Runs’ difficult. Hence, you would want to look at a value of 80 – 85% if you are a dedicated runner with an ambition for faster race results. Fortunately, our lactate threshold is very reactive to training. Much more so than our VO2max, for instance. There is, however, a common misconception that ‘Tempo Runs’ are the holy grail of lactate threshold training. Because running at lactate threshold may not be enough of a stimulus to considerably upgrade lactate threshold. Anaerobic training is, in fact, more effective. A viable alternative for Tempo Runs are Cruise Intervals at 10K pace. This faster pace produces 30% more lactate than the traditional Tempo Run. Hence, the training stimulus is much greater. For instance, 2x 3K (~2miles) at 10K race pace with 2min rest in between, depending on your training level. Use it interchangeably with Tempos if you are a half-marathon or marathon runner. VO2max intervals at 5K to 3K race pace are yet another step up the blood ph scale. They produce 2 – 3 times as much lactate as Tempos at half-marathon pace. The beauty of this high intensity is that your VO2max gets trained at the same time. 5K pace efforts are usually run at 4 – 5x 1K intervals with equal (or slightly shorter rest) in between and 3K efforts lend themselves well to 5 – 8x 800m repeats. The perhaps most underutilized type of workout for long distance runners are 400m track repetitions at 1500m (mile) race pace (with a work to rest ratio of 1:2). This intensity exceeds 100% of VO2max and is a great way to train your intermediate fast-twitch and fast-twitch muscle fibers to function better with rising lactate values. This type of training can be conducted once very 2 weeks. Finally, we have cross training. There very fact that it violates the rule of specificity is in actuality a bliss. The reason being, muscles trained anaerobically that aren’t used in running are able to import excess lactate from the bloodstream. Of course, this requires that parts of your cross training activities are performed at high-intensity. Don’t overdo it, though, as it could get in the way of recovery. Given the importance of the lactate threshold, any serious runner is well-advised to impart some sort of high-intensity training into his training schedule year-round. A good start would be to replace one Tempo session a week (or every 2 weeks) with one of the anaerobic workout descriptions above. You will be surprised how quickly you will be able to run faster paces more effortlessly.